Unifor strike puts dent in Chevrolet Equinox inventories in U.S.
A strike by workers at a General Motors factory in Ingersoll, Ont., could begin to impact consumer choice and dealer stocks of the Chevrolet Equinox in the U.S., where it's one of the top-10 selling vehicles. 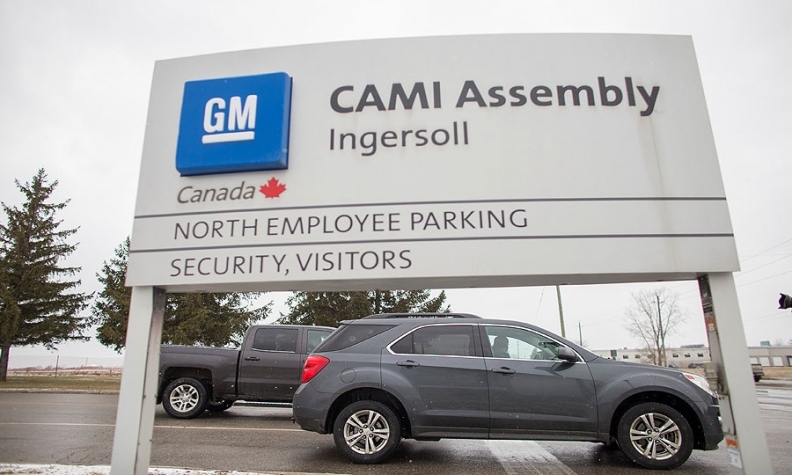 Production of the compact crossover at CAMI Assembly has been idled since Sept. 17, when workers walked off the job after bargainers for Canadian union Unifor and General Motors hit a roadblock in contract talks over job security. Unifor Local 88 said in a blog post Thursday the two sides are still far apart. They have been engaged in daily talks but are taking a break over the Thanksgiving weekend. Talks will resume Oct. 10. Stockpiles of the Equinox, GM's second best-selling nameplate in the U.S., are quickly drying up, despite the automaker's attempts to ramp up Equinox production at two plants in Mexico to supplement Canadian output. U.S. inventory of the Equinox dropped to 43,453 vehicles, or a 41-day supply, at the beginning of October, according to the Automotive News Data Center. Inventory stood at an all-time high of 74,400 units, or a 66-day supply, in June. The number of days of supply in Canada aren't available. "That's going to be hard on Equinox to compete on such a limited quantity in such a hot segment," said Jessica Caldwell, senior analyst and director of pricing and industry analysis for Edmunds.com. "We would expect sales to pick up in the last quarter of the year." In 2016, U.S. sales during the last three months of the year accounted for 28 per cent of domestic Equinox volume during the year. Monthly inventory of the vehicle averaged 42,550 units in 2016, with a low of 33,700 in July -- the lowest level since 30,900 vehicles in August 2012. GM has downplayed the significant drop in Equinox inventory levels since the strike began two and a half weeks ago. "We believe we have sufficient inventory and production to meet demand while negotiations continue and we continue to work closely with dealers to ensure customers continue to be well served," GM said in a statement to Automotive News. A handful of U.S. Chevrolet dealers last week told Automotive News that their Equinox inventories hadn't been directly impacted by the strike, however it was only a matter of time until they would be if the walkout continued. "We're always worried, especially on a new hot model," said Rick Cantalini, owner of Vandergriff Chevrolet in Arlington, Texas, and a member of the Chevrolet National Dealer Council. "The vehicle is selling very well. We really wanted to build inventory, not deplete it." GM and Unifor remain far apart in settling the strike. Union leaders fear GM could shift Canadian Equinox output and jobs to Mexico, as the automaker did this year when it sent GMC Terrain crossover production from CAMI to a Mexican plant. They want CAMI to be named as the lead North American producer for the popular crossover. GM is producing the Equinox at its San Luis Potosi and Ramos Arizpe plants in Mexico. However, production is not at the volume of CAMI. The company has declined to release production capacity or any change in plans for those factories as a result of the strike in Canada. "We don't know the ramp-up at the other production facilities in Mexico," Caldwell said. "That's the X factor." The Mexican plants combined to build 40,017 Equinox models through August since production began in April. CAMI had produced an estimated 132,388 Equinoxes through August, according to the Automotive News Data Center.